Now, the transition is getting an assist from Heritage Foundation officials including Becky Norton Dunlop, a distinguished fellow at the foundation; former Reagan Attorney General Ed Meese, a distinguished fellow emeritus at Heritage; Heritage national security expert James Carafano; and Ed Feulner, who helped found Heritage. Rebekah Mercer, a Heritage board member and major pro-Trump donor, is on the transition team’s 16-member executive committee, and a transition team source said she is working with Heritage to recruit appointees for positions at the undersecretary level and below (though she has struggled to find people interested in taking lower-level jobs, according to a New York Times report). The transition team also includes other prominent activists and thinkers with close ties to Heritage, such as former Ohio Secretary of State Ken Blackwell, the activist involved with several conservative groups who is running Trump’s domestic transition team. He has written for Heritage and has personal relationships with many at the organization. The one world religion too will be led by the final antichrist Pope, but his religion won’t be the same Catholicism that we are familiar with. 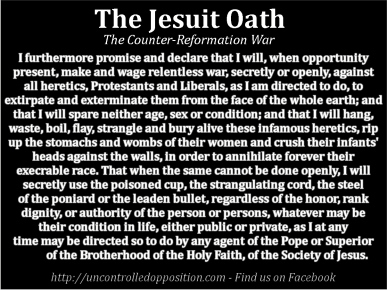 From the time of the Second Vatican Council, the Jesuits have been working to morph all religions into one as a primer for the bringing forth of the antichrist final pope of their making via the Jesuits’ ecumenical movement. The new age beliefs mixed with deceptions like evolution are more in line with what the one world religion will be like with the Jesuits having transformed the Vatican to align with some of these views already, like when the Vatican declared to subscribe to evolutionism under John Paul II and now with the Jesuit Francis the First, this transformation has gone into overdrive with the pope saying things like homosexuals may be saved; communistic heresy. 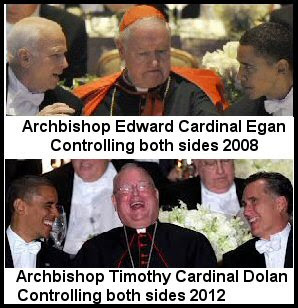 Though there are traditional Catholics who are disillusioned with these changes, the majority of Catholics are perfectly okay with most of this because they will believe whatever the pope says and/or they already reside in socialist/communist areas like Mexico or Latin America. 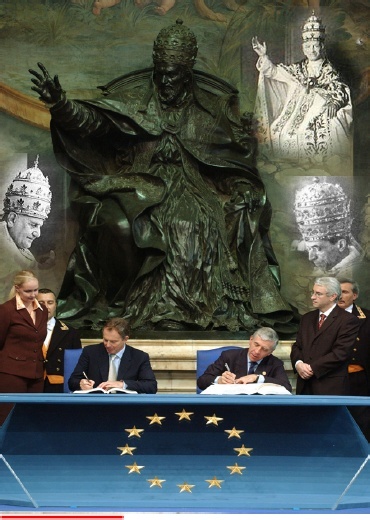 Regardless, the antichrist pope will have satanic powers that the world will marvel at. For one, he will be slain by a sword and will rise from the dead whenceafter all the world will wonder after him (Rev. 13:3). He will also blaspheme God and power will be given to him over “all kindreds, and tongues and nations” (Rev. 13:7). 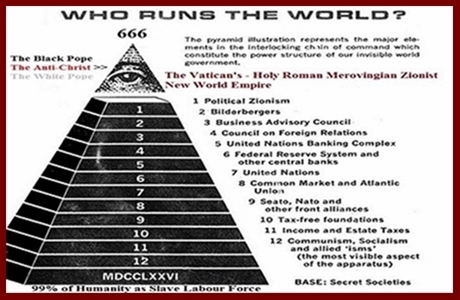 The antichrist’s Hebrew/Jewish false prophet similarly will have power to do great wonders. He will make fire come down from heaven to earth and this false prophet will cause all on earth to worship antichrist and his image. Those who refuse will be killed (Rev 13:15). Who would design a flag with the exact same colors as the hated, just fought to the death British? As well as the hated British East Indian Tea Company, who Freemasons, dressed as Native Americans (or “Indians”, because allegedly Columbus went the completely wrong way!). Father Andrew White is who the US “White” House is named after!! The Jesuits came to minister to the Catholic colonists, but also with an eye to the conversion of the native population. “Who then can have a doubt,” White wrote before leaving England, “but that by this one work so glorious, many thousand souls may be led to Christ?” White and his companions overcame the hostility of some of the tribes, the prejudice of Proprietor and English settlers, and the great barrier of language to convert several tribal chiefs. At St. Mary’s City White made of an Indian hut the colony’s first chapel. The Capital of Amerigo, the District of Columbia is named after Pesephone, the Godess of War not the other Catholic Explorer Christopher Columbus, as the wealthy elite history books have sold us. 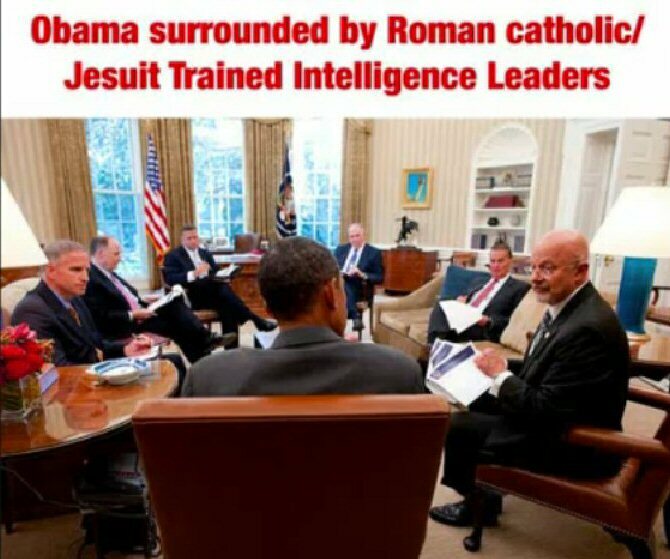 And the White House is named after a Jesuit Andrew White. Then Daniel Carroll (Catholic) gives the land for our National Capital. Then after 26 years of Jesuit education John Carroll (Catholic) founded Georgetown University in 1789 the same year we became a country. Andrew White (1579 – December 27, 1656) was an EnglishJesuitmissionary who was involved in the founding of the Maryland colony. He was a chronicler of the early colony, and his writings are a primary source on the land, the Native Americans of the area, and the Jesuit mission in North America. For his efforts in converting and educating the native population, he is frequently referred to as the “Apostle of Maryland.” He is considered a forefather of Georgetown University, and is memorialized in the name of its White-Gravenor building, a central location of offices and classrooms on the university’s campus. George Calvert, the first Baron Baltimore, whom White is credited in helping to turn to Catholicism in 1625, wrote to White from his colony on the Avalon Peninsula inNewfoundland after 1628. White’s further interest in America is shown a letter from Superior General Mutio Vitelleschi in a letter dated March 3, 1629, approving a mission to America. Though George Calvert died in 1632, his son, Leonard Calvert, second Baron Baltimore, continued the colonization program. Baltimore had wanted White to help found a new colony in the Chesapeake Bay which had been chartered June 20, 1632. White himself wrote of the benefits of converting the native population, and in a document dated February 10, 1633, he specifically advocates Catholic settlement in “lord Baltimore’s Plantation in Mary-land.”He describes to potential financiers a paradisaical land with majestic forests and fruitful soil, advertising 2,000 acres (8 km2) of land for each potential settler. On November 22, 1633, he took Baltimore’s offer and set sail from Cowes on the Isle of Wight with lord Leonard Calvert and fellow Jesuits John Altham Gravenor and Thomas Gervase on The Ark, one of George Calvert’s ships. Their landing on March 25, 1634, on St. Clement’s Island marks the birth of the Maryland colony. The anniversary of this date is now celebrated as Maryland Day. In saying Catholic Mass that day, he became the first priest to do so in the original thirteen English colonies. By July of that year, White had written his first discussion on the new colony, titled A Relation of the Sucessefull Beginnings of the Lord Baltimore’s Plantation in Maryland. Sections of this were used to further advertise the colony.White spent most of the next decade in St. Mary’s City, working on English-Native American relations, particularly with the Yaocomico tribe, which consistently saw favorable trade treaties from Calvert because of White, and the Anacostans. In 1637 they were joined by Jesuits Thomas Copley and Ferdinand Poulton, and between 1634 and 1650 there averaged four permanent Jesuits in the Maryland Colony. To further his missionary work, he wrote dictionaries and translated the catechism into the native languages. On July 5, 1640, he famously converted Chitomachon, the chief of the Piscataway Indians, to Christianity. The chief was baptized as Charles. He later baptized a princess of the Patuxent Indians, and much of her tribe. In 1933, the architect and writer Christopher La Farge designed a monument to White that is located just outside St. Mary’s City. Return to England. The English Civil War was to cut short his missionary work. In 1644, Richard Ingle and Puritan colonists from the neighboring Virginian colony of Jamestown, which had previously rebuffed George Calvert’s visit, first raided St. Mary’s City. Ingle succeeded in burning the town and, with the aid of William Claiborne, in controlling the Maryland Colony. White was again arrested for his Catholic preaching, and in 1645 he was sent with Thomas Copley in chains to London. Once there, he was tried for the crime of returning to England after being banished in 1606, which carried the punishment of death. He escaped this fate by arguing that his return was not of his own will. His petitions to return to Maryland denied, he spent the last decade of his life quietly in England until his death on December 27, 1656. The Jesuits of the Maryland province had always relied on plantations to support their ministries. The estates were extensive, totaling 12,000 acres on four large properties in Southern Prince Georges, Charles and St. Mary’s counties, and two smaller estates on Maryland’s Eastern Shore. In 1634, when the Jesuits arrived in Maryland, Lord Baltimore awarded them quasi-estates in which they were permitted to live off the rent of tenant farmers. However, as University Dean Hubert Cloke explains, “The system was totally antiquated and romantic, not related to reality, and they realized they were not going to make any money.” So, the Jesuits turned to indentured servants, English men and women who worked the land for set terms in return for the passage from England to Maryland. 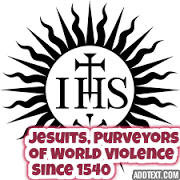 But as working conditions improved in England, the supply of indentured servants dropped and the Jesuits once again found a new way to work the land. By the 1680s they relied upon a fully developed slave system. Compared to other plantation owners in the area, when it came to slavery, “The Jesuits were no better or worse,” according to Cloke. Many of the slaves had been gifts from wealthy Catholic families to sustain the Church. The abolition of slavery was not an issue in the area until the early nineteenth century, when Georgetown’s Jesuits became deeply divided over the issue of slavery. In a generational divide, an older group of Jesuits, mostly European born, felt a patriarchal connection to their slaves and were unwilling to sell them. A younger, American-born group, a minority, felt that the money invested in plantations should be spent on institutions in cities like Philadelphia and New York with their rapidly growing Catholic populations. It seems neither faction had any particular moral quandaries with the six plantations and the nearly 300 slaves owned by Georgetown’s and Maryland’s Jesuits. This rift is just one of the things American Studies students learned when history professors like Cloke and Emmett Curran introduced the Jesuit Plantation Project into the American Studies curriculum in the spring of 1996. The project involved students transcribing and digitizing hundreds of documents from the Jesuit’s Maryland Province Index recording the Georgetown’s Jesuits’ complicated relationship with slavery. With only two exceptions, all the higher-ranking Jesuits in the province during the time were foreign-born and of the older faction. Since only U.S. citizens had temporal jurisdiction, foreign Jesuits had no authority over the Mission’s estates. 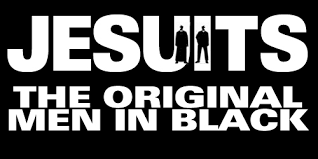 This meant that a younger group of American Jesuits, a minority, controlled the destiny of the estates, and this group wanted to end slave operations. “They considered the plantations and slaves as a losing business enterprise and thought the Society should rid itself of both plantations and slaves,” Curran said. Abolitionists presented an economic rather than moral problem for these Jesuits. With a growing abolitionist presence in Maryland, some of them feared a devaluation of their property, their slaves. Maryland was a state in which slavery had a tenuous hold, the economy was no longer driven by slave labor. According to reports, the general debt of the mission was close to $32,000 by the 1830s, a large sum for the time. “It was not a market for growing crops, but for growing slaves,” said Cloke. The real money was to be made not from the work a slave could do in Maryland, but from the hugely profitable business of selling the slaves downriver. 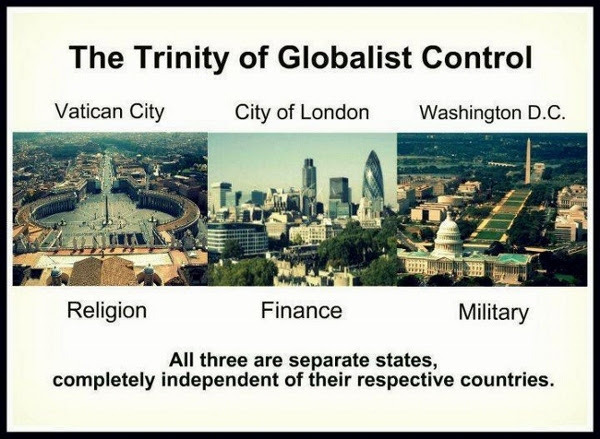 Washington D.C. is a separate country (actually, a for profit private corporation written as: THE UNITED STATES OF AMERICA whereas the United States of America is under the US Constitutional law. That is why our BIRTH CERTIFICATE, SSN, DRIVERS LICENSE, BANK STATEMENTS, COURT DOCUMENTS, etc. are all in capital letters. Washington, D.C is overseen only by Congress, who resides in Wash, D.C. US taxpayers pay their taxes (voluntarily) to the USA CORPORATION based in Puerto Rico, whose corporate owners are registered in the City of London and the Vatican. 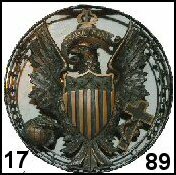 The Corporation of THE UNITED STATES OF AMERICA”. With Daniel Carroll providing land for the Capitol, with Charles Carroll as War Commissioner, controlling all the executive duties of the military department, with its ammunition supplies of cannon balls, shot, kettles, spikes and nails to the army, with John Carroll an intimate friend of Franklin, even living in Franklin’s house, and District of Columbia donor and Capitol CommissionerDaniel Carroll close to Washington, with John Carroll establishing Jesuit Georgetown University, whose seal proclaims a Roman eagle grasping the world and the cross, State and Roman Catholic Church with a banner in its beak, “Utraque Unum,”-“Both Together,” with the mayor of the District of Columbia Carroll’s nephew Robert Brent, it is not hard to see the proud Roman Catholic component of the American Revolution…and the Roman Catholic vision of a land where Roman Catholicism would be given the freedom to expand to the maximum…to take over the nation…and the world.